Three defeats in a row, eight games without a win, the only thing stopping a full-blown crisis breaking out is the fact that we’re still somehow comfortably away from relegation danger. The most dispiriting thing about last week’s defeat to Luton Town was that it looked as if the players didn’t even believe they could win. Keep that up, and we will be in relegation danger. While our league position doesn’t mean that we necessarily need a win, boy, do we need a win now. Having gambled on a new formation and some key personnel changes for the past two games, Mark Robins is in a stick or twist situation with neither guaranteeing a solution to our current malaise. Sticking with something that hasn’t noticeably improved matters doesn’t seem like an intuitive option, however, further changes risk making things more disjointed and denting confidence further. It wouldn’t be a surprise right now were Mark Robins to feel like bringing Michael Doyle back into the side to cure our recent ills. Robins must have been hoping over the past two games that we could be weaned off the reliance of the leadership of a 37 year-old player, but the level of spinelessness in last week’s showing against Luton may well tempt the manager into bringing Doyle back – regardless of the technical quality of his recent performances. A recall for Doyle could well see a return to the 4-4-2 system that we have deployed for much of the season. Unless shunted to the wing, Doyle’s return may call for Tom Bayliss to be taken out of the side – as unthinkable as it is, it may help him in the medium-to-long-term to avoid burning out. A 4-4-2 would also probably make it unlikely that Reise Allassani would be rewarded for an intriguing cameo last week with a place in the side, with the studier Jordan Shipley likely to come in on the left-wing. This could well be a pragmatic team selection with an emphasis on getting back to basics. If one of our strikers could pop up with a goal, such an approach may be rewarded with a win. It was Russell Slade’s last stand at Coventry City when we last took on Shrewsbury Town. Just one league win in 12 games in charge, Slade’s side travelled to Shropshire knowing that relegation was almost certain at that point. In an otherwise dull 0-0 draw, this game was most notable for injuries forcing Slade to select his best central midfield pair of Ben Stevenson and Gael Bigirimana, really hammering home Slade’s uselessness during his short, but damaging, stint at the club. He was promptly sacked and replaced by Mark Robins the day after. The third permanent manager of the calendar year for Shrewsbury Town and Ricketts’ second managerial posting in the space of six months. For Shrewsbury, former Sky Blues defender Ricketts was brought in after the failure of summer managerial appointment John Askey to get a tune out of a squad that had been decimated in the wake of last season’s League One Play-Off Final defeat and the subsequent departure of his predecessor Paul Hurst to Ipswich. For Ricketts, it is a remarkably quick opportunity to manage as high as the third-tier having taken over non-league Wrexham in the summer and leading them to the fringes of the National League automatic promotion places. His managerial CV is too short to draw definitive conclusions from, but he had Wrexham playing some slick football – even getting goals out of Stuart Beavon – while his Shrewsbury Town record is one win, one draw, and one loss. 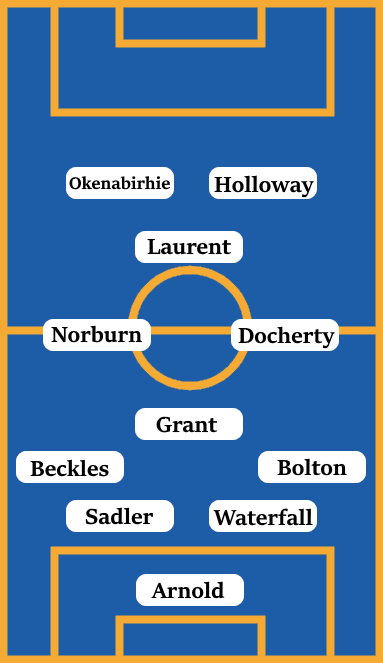 The challenge for each of Shrewsbury Town’s managers this season has been to fit their best players into the same side, with four of their best players being central midfielders. Caretaker manager Danny Coyne eventually settled on a 4-4-2 diamond system, with the nous of Anthony Grant protecting the defence, the ball-playing Ollie Norburn on the left, the box-to-box Greg Docherty on the right, with the industrious Josh Laurent at the tip. Of the four, Rangers loanee Docherty has really caught the eye, scoring and creating some important goals and putting himself on the verge of a recall to his parent club in January. Another player who has benefited from the new system is forward Fejiri Okenabirhie. A goal threat from either the wing on more centrally, Okenabirhie was strangely overlooked by former manager John Askey for much of the campaign, with non-goalscoring strikers Lenell John-Lewis and Aaron Holloway preferred. Okenabirhie’s pace, skill and eye for goal have really come to the fore in recent weeks, aiding Shrewsbury’s rise away from danger. The downside to this narrow new system has been there isn’t a natural role for tricky winger Shaun Whalley in the starting XI. One of few key players to have stuck around from last year, Whalley marries his dribbling ability with an end product and is a potential game-changer for Sam Ricketts from the bench. While Shrewsbury are looking good at the moment in midfield and attack, a lack of pace in the back-line looks an area to target. The centre-back pairing is the experienced duo of Luke Waterfall and Mat Sadler, while they currently deploy a pair of full-backs who are possibly more natural at centre-back in James Bolton and Omar Beckles – although the more natural pairing of Josh Emmanuel and Ryan Haynes are available in reserve. Furthermore, following the poor form of Huddersfield Town loanee Joel Coleman in goal, Shrewsbury are calling upon Steve Arnold between the sticks, a player more used to non-league football. We really should be looking to get at Shrewsbury back-line either with counter-attacking pace or by adopting a more proactive approach, the question is whether we have the bravery and confidence to execute either strategy.